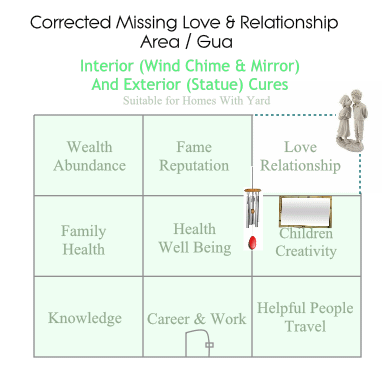 Feng Shui Cures For Missing Bagua Area - Is Your Wealth or Love Area Missing? For the best results, Feng Shui cures for missing Bagua Area in your home can be applied on the exterior as well as interior of your home. If you live in a house with a backyard you should apply exterior cures first. For the strongest effect you can also enhance missing area inside your home as described below. If you can't apply exterior cures because you don't have any property or live in an apartment, concentrate on curing missing Life Area inside your home. You can see some of the helpful examples of interior and exterior cures on this page. Once in place, these Feng Shui cures will bring an extra energy into the missing center to counterbalance any problems you are currently experiencing. If cures are not applied you will continue to experience difficulties and obstacles in the corresponding Life Area whether it is your Love, Career, Money or other important areas. 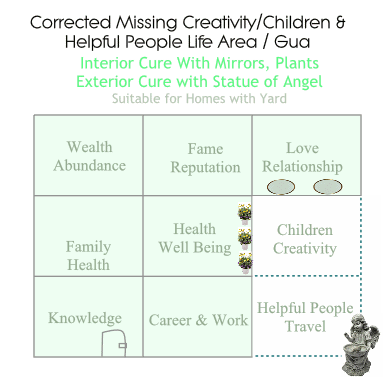 For helpful tool to apply Feng Shui cures for missing bagua areas click here for our Good Enhancement Bagua. It will help you to pick the most effective items, shapes and colors. As you can imagine missing Children Area can cause misunderstandings and problems between you and your children. Or If you are an artist for instance, missing Creativity Bagua can hinder your artistic vision and opportunities. On the top of that this home is missing Helpful People and Travel Area. If you are dreaming about finally going to your favoritevacation spot or visit parents in your home country you need to energetically enhance missing Travel Feng Shui area. 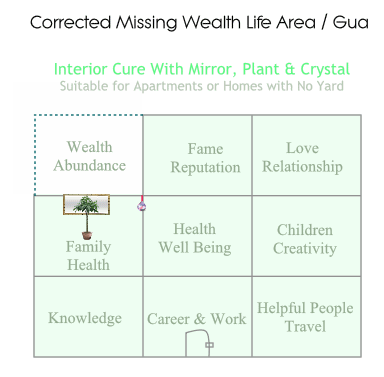 Or if you are looking for a new job, new school to attend or new profitable business opportunity it would be very wise from you to use Feng Shui cures for missing Bagua to enhance Helpful People Area as you see above. Our drawing above and Feng Shui enhancements are only examples. You can use any different combinations of items or colors as long as they agree with Bagua colors and energetic cures mentioned above. Be as creative as you like. Two large mirrors were placed along the wall of missing Children and Creativity Area to open up the space and energize the area. Two mirrors were used because they were placed on the wall in the Love and Relationship Life Area. This Bagua Area requires all items to be displayed in two's to symbolize love and unity with your partner. Along the Health and Well Being Wall yellow flowers were placed in beautiful white planters. In Feng Shui Ba-gua, Health Area is represented by yellow color and Children and Creativity Area is strengthened with color white. Healthy growing plants are also Feng Shui cure for stabilizing and re-energizing the missing areas. This missing Life Area was symbolically fixed by placing the statue of Angel taking care of thirsty bird. This exterior Feng Shui cure will not only energize missing Helpful People Ba-gua Area but will program your subconscious to expect and attract helpful people, mentors, teachers, sponsors etc coming into your life to help you achieve your goals.